Be the first to hear about their new releases and deals. Download the Booksprout app and search for Ann Tinkham today! 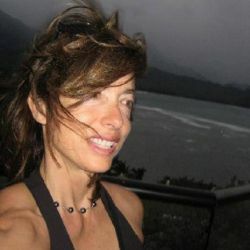 Ann Tinkham is a writer based in Boulder, Colorado. She is an anti-social butterfly, pop-culturalist, virtual philosopher, ecstatic dancer, political and java junkie. When she's not tinkering with words, she's seeking adventures. Ann has talked her way out of an abduction and talked her way into the halls of the United Nations. She hitchhiked up a mountain in Switzerland and worked her way down the corporate ladder. Ann has flown on a trapeze and traded on the black market in Russia. She cycles up steep canyons, hikes to glacial lakes and mountain peaks, and blazes her own ski trails. As soon as she amasses a fortune, she plans to buy an island and hopes she won't be voted off her own island. Her fiction and essays have appeared in All Things Girl, Apt, Denver Syntax, Edifice Wrecked, Foliate Oak, Hiss Quarterly, Lily Literary Review, Short Story Library, Slow Trains, Stone Table Review, Synchronized Chaos, The Adirondack Review, The Battered Suitcase, The Citron Review, The Literary Review, Toasted Cheese, Wild Violet, Word Riot, and others. Ann's essay, "The Tree of Hearts" was nominated for a Pushcart Prize and her story, "Afraid of the Rain" was nominated for Sundress's Best of the Net Anthology.